I am thrilled to have Jane from xo, Lauren and Jane here today to talk about my favorite thing, books! 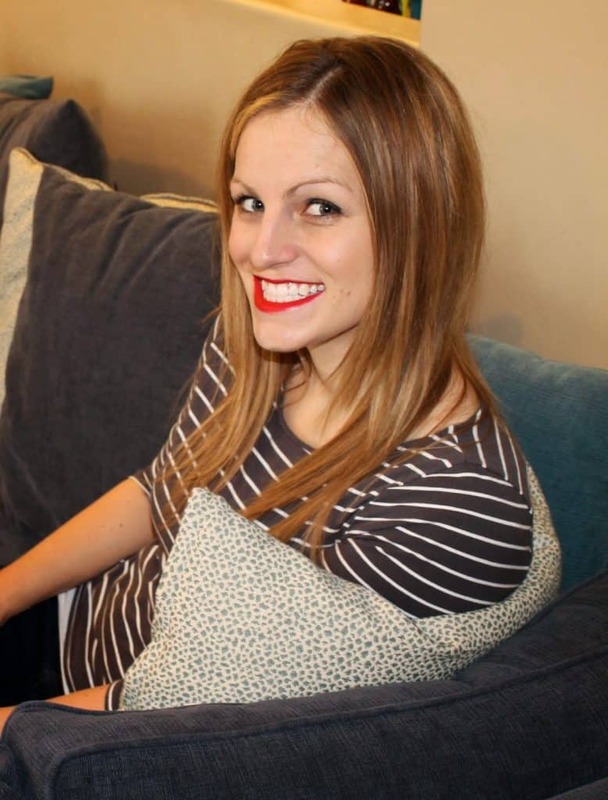 Make sure you check out her blog, some of my favorite posts include Grilled Fruits and Vegetables and Lauren’s Postpartum Survival Kit. I’m Jane from xolaurenandjane.com, a blog about fashion, beauty, kids, life, DIY and everything in between. I’m excited to be here at Housewife Eclectic today! Like Debra, I’m an obsessive reader. I love reading and am so happy my almost 2-year-old loves it as much as I do. I regularly find her sitting in the glider in her nursery “reading” to herself. It’s cute AND as the daughter of a teacher, makes me so happy because learning to love reading at a young age is important. 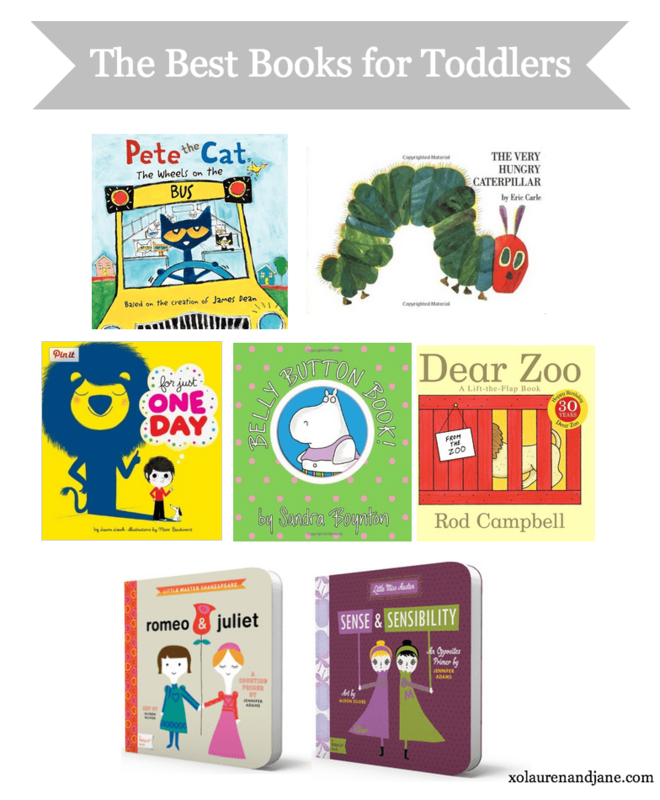 Today I’m sharing some of our favorite, must-have (and in our opinion, the best) toddler books. Pete the Cat The Wheels on the Bus: A fun spin on the traditional “wheels on the bus,” Pete the Cat is the driver and we meet several animals along the way. Pete the Cat is a series about a cat who goes on all sorts of adventures. One of our other favorite Pete books is Pete the Cat: I Love My White Shoes. The Very Hungry Caterpillar: We love this book so much that we have it in both a large size and a smaller size that fits nicely in my diaper bag. Even as a baby, my daughter was fascinated by this book and loved watching the caterpillar grow larger and larger. Now, as a toddler, she chimes in when you ask her to point to certain fruits or foods and loves the final reveal page, when we see the beautiful butterfly the caterpillar has turned into! For Just One Day: We love animals at our house, and this book is filled with them, in a story about a child who pretends to be different animals on every page. The moral of the story is great: the very best thing you can be is exactly who you are! This is one book we will keep around for years. Belly Button Book: Sandra Boynton is a favorite board book author of ours. In fact, my husband loves her books so much that since my daughter was a teeny tiny infant, whenever he spots one of her board books, he buys it. I think we own nearly every one! Belly Button Book is our favorite, though. Ask my daughter to point to her belly button, and she gets the biggest, cheesiest grin on her face as she points to it. Dear Zoo: More animals! Lift-the-flap books are perfect for my daughter and her hand-and-eye coordination, and plus, she gets excited to see what’s behind each. We’ve used this book to teach her different animal sounds, so as we flip to each page and pull back the tab, she immediately makes the correct animal noise. This book has been a great learning tool. BabyLit Series: My friend Lauren (the same gal that I blog with over at xolaurenandjane.com) introduced me to this series when my daughter was first born and it’s been love ever since! They’re fun reads for both my daughter and me, since these are classics-turned-children’s-books (and classics that I love!). As the BabyLit website says, “BabyLit is a fashionable way to introduce your toddler to the world of classic literature.” We own five BabyLit books (so far! ), including Pride & Prejudice, Romeo & Juliet,Jane Eyre, Alice in Wonderland and Sense & Sensibility. What are some of your favorite toddler books? Follow us on Pinterest and check out our kids’ board for more books and items we love for kids. Be sure to check us out on Facebook and Instagram, too. Have a great day! Dear Zoo is a favorite here too. I hadn't seen the baby lit books yet. I'm really interested in those! Those are some great choices. I have to check some of these out for my daughter. We love the book "The Very Hungry Caterpillar" and just picked up the anniversary editiion. Cute books.. i wish my kids were into reading more.. but they are more into writing… so maybe we will read their books later on in life..
Pete the Cat! I used to work in a bookstore and perhaps got a little too into the children's section. So many people have written really incredible books for kids, so it's always great to see people rounding up their favorites and continue to foster a love of reading in their children at a young age. These sound like some really good books! I love that besides the classics (like the Very hungry catepillar) there are some new ones for me. It's always good to find about new books to read! Pete the Cat, Dr. Seuss, Go! Dog Go! were some favorites. Very Hungry Caterpillar is a favorite of my son's but my daughter didn't love it–not sure why. Eric Carle makes a beautiful book about winter….it might be called Snow–not sure but we all love that one. I would love to add pride & prejudice and sense & sensibility in my nephew's book collection. Other than "The Very Hungry Caterpillar" I have never heard of any of these childrens books! They all seem like a great read though! Love your selection! Will share with my friends who have little ones! We love the Hungry Caterpillar and Pete Cat (as my son calls it). Love this list!